When Momma is sick she still has to be Momma! Children and husbands still need her. Perhaps Husband can do a few things to help, but most of the time, he must go to work to provide for the family. 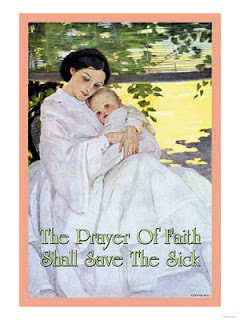 It is a mother's duty to care for her children and home as best she can, even in times of illness. In times of illness, it may be an opportunity to take a day to snuggle under cozy blankets, looking at books together and dozing off from time to time. Sipping tea with raw honey and lemon essential oil is a soothing treat. Having ingredients on hand for simple meals is helpful. Having some meals prepared ahead of time and then placed in the freezer is even better! Then all you must do when you are feeling under the weather is take the meal out of the freezer to have dinner at hand. This way you will not resort to convenience foods and other unhealthy fare. Also make sure you have plenty of tissues on hand for cold season. Keep the bathroom clean by wiping it down every day so if anyone comes down with a stomach virus, the toilet is not terribly unsightly. The whole family will appreciate this during sickness or in times of health. On sick days, after the family is fed for the night and the dishes washed, everyone can retire to bed early to get enough rest. Remember, your body heals while you sleep. This reminds me of a Homemaker video I was watching the other day when an older Mother was recalling the reality of having to take care of her first child when she was sick. She wanted her husband to stay home, but she knew it was not possible, and realized that she was responsible for that child rather she was sick or not. Even if the Lord has not blessed us with children (which is my case), wives still have to care for their husbands and make sure tasks are completed and meals are made. They should not resort to laziness or idleness! Wives need to remember that the Husband works very hard everyday and therefore, are deserving of having decent and healthy meals. Whenever I got sick my children would play "nurse" and look after me. My youngest in particular would be such a dear and take such good care of me. My husband would cook the dinner and make sure the house was kept tidy. I didn't get sick very often, but when I did, they take over the role of housekeepers. children know when it is time to "care for mum". Mrs.Q, Thank-you for this timely reminder. I do hope you are not ill? So true, Lady Rose. I'm sure you are a good wife! You are very welcome, Mrs. A.